Microfiber Swivel Mop&apos;s reusable mop pad is made of special looped microfiber to quickly & easily loosen, lift and trap dirt and grime like magic while effortlessly gliding on floors. The 16" wide swivel head conveniently maneuvers around furniture and into tight areas. Its low profile design goes under furniture with ease. 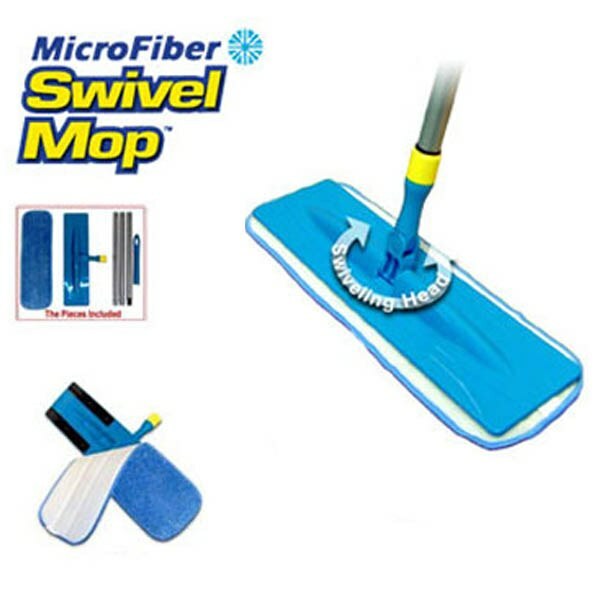 Microfiber Swivel Mop works great wet or dry! Great for hardwood, tiles vinyl floors! Special looped microfiber really grabs on to loose dirt cleaning surfaces more efficiently. Use wet or dry! Works on: Hardwood Tile Vinyl And more Save money on expensive disposable pads and reduce the use of harsh chemical cleansers in your home. Eco Friendly! Microfiber pads are machine washable.